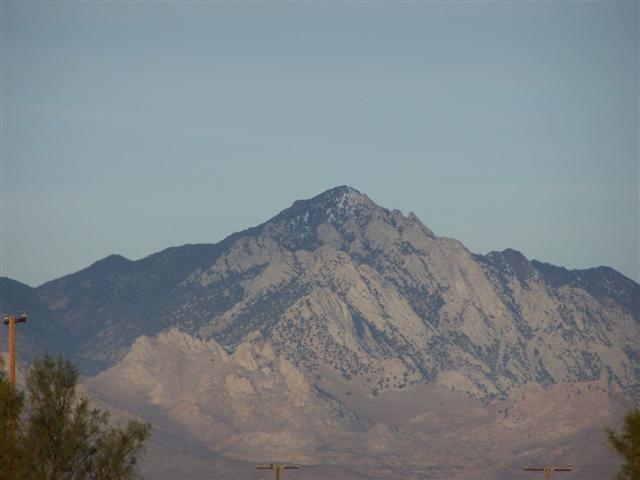 CLIMB OWENS PEAK, RIDGECREST CALIFORNIA! Don’t tell me there ain’t nothin’ to do in Ridgecrest! Owens Peak is a mountain Ridgecrestites have always marveled at, and will even pay a prime price to have it forever in their sights. Yet, the emotional rush is completely overwhelming when one is able to view Ridgecrest, California from the opposite vantage point, that is, from the top of Owens Peak. Not only can one catch an eagle’s eye of the entire Indian Wells Valley, but the Searles and Panamint Valleys can be clearly viewed to the east, Olancha Peak and Mt. Whitney to the north, and Lake Isabella and Onyx Valley to the southwest. Wow! The panoramic perspective at the top of Owens Peak is absolutely breathtaking! If you are thinking of tackling Owens Peak do not imagine it to be a relaxing Sunday stroll. From the Owens Peak Trailhead parking lot the hiking trail starts off as a former four-wheel drive road which passes by blooming wildflowers and the grassy upper Indian Wells Canyon. The grade gradually ascends into a footpath where you find yourself stepping over streams of water either surfacing from the ground or seeping out of the rocks. About an hour into the trek the path turns very steep and is sometimes unidentifiable as it switches back and forth through a mixture of earth and stone. The greatest challenge is about halfway up when one is faced with an ascending wall of solid rock boulders, some of which can be hopped across, while with others it often takes a careful and balanced self-hoisting to get up to the next level. At one point the trail completely disappears and our guide directed us to stay to the right as we had to literally, one-by-one, slowly scale up 20 feet of solid granite rock. Making sure your footing was always placed in a protruding node in the rock surface was the key to making it up the next section of the dirt trail. As one nears the crest, ponderosa pine become more prominent and cast a coolness and refreshment to one’s laborious workout to the top. Stepping up to the summit one discovers a rather level rocky area only about 25 feet long and about 12 feet wide. Someone has even carried up a small metal ammunition box and placed in it a spiral notebook and pencil where many climbers have posted their names and comments over the recent years. The view from 8452 feet high is indeed emotionally arousing as one tries to take in all at once the intricate inner twinings of the surrounding valleys and canyons below as they rise up on all sides, and seem to all be focused, for the moment, towards the apex of Owens Peak. The exit trail starts at the south end of the summit and weaves down and back up again through a few mini canyon-like passages. The decent from the mountaintop offers challenges but with gravity on one’s side it seems less of a workout. About a third of the way down a narrow passage through a white rocky area must be carefully navigated as one’s balance and sure footing is again put to the test. Eventually the larger rocks turn into a mix of fine gravel-sized sand. In some sections it is more convenient to maintain a balanced downward slide rather than try to tromp through ankle deep grit. The Owens Peak Trailhead parking lot can be reached by turning off Hwy 14 onto Indian Wells Canyon Road Junction, a dirt road marked “waypoint IWCJ14”, which is 0.2 miles north of the Indian Wells Valley Brewing Company, or 1.6 miles south of Hwy 395. IWCJ14 turns into dirt road SE164. Carefully follow SE164 and the marker signs all the way to the top of the canyon to the parking lot. For panoramic photos from the top of Owens Peak call me, Clint Freeman at (760) 382-1082, and let's talk! Our Owens Peak hike took place Friday April 22, 2011.